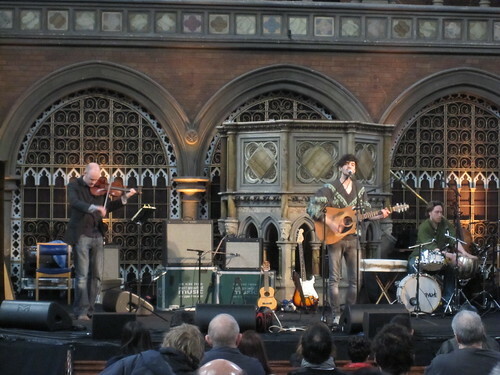 Last Saturday I was back at the Union Chapel for the second time in little over a month (after the recent Sunday Driver gig) for Daylight Music. 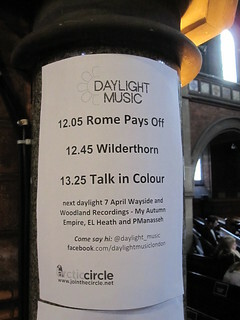 This time I was playing with Talk In Colour, taking our electronic soundscapes and dirty basslines out to play in the Chapel’s glorious acoustics. Things didn’t start off well, with a couple of unexpected hitches meaning that our soundcheck ran late, holding everyone up and making the whole gig run behind schedule. We can only apologise profusely to everyone and promise not to do it again. Anyway, proceedings kicked off with Rome Pays Off – a trio with the rather unusual lineup of two bassists and one guitar. 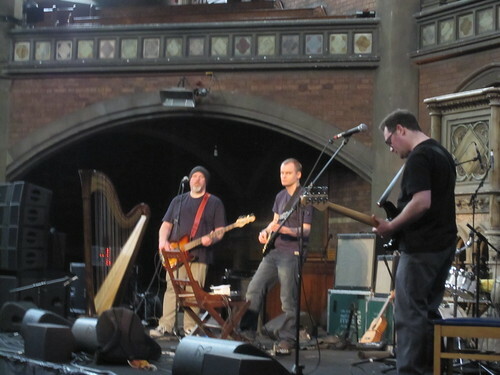 Probably best described as “drone-core”, their lush soundscapes echoed round the church and sent a shiver up my spine. Next up were the fantastic Wilderthorn, whose set of not-folky-at-all-despite-what-you-might-expect acoustic songs was a great treat. I even forked out a fiver for their new EP, which is always the sign of a good gig. This is my counting face! 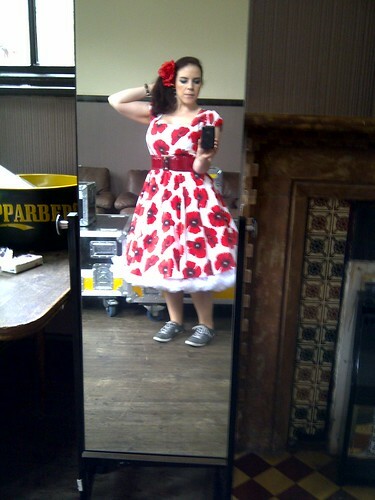 Finally, three cheers from my fabulous new frock from Lady Vintage – how awesome is this? And only 50 quid! This entry was posted in Gigs, Music, Talk In Colour. Bookmark the permalink.